I think there’s something almost genetic in our response to the whistle of the freight train. On evenings when we have the window open I pause and listen for just a moment when I hear the sound of the train. That must be why this song performed by the Smothers Brothers resonates with me now just as much as it did when I was a pre-teen. When we were growing up that gave us a laugh the first time we heard it and still a chuckle the 50th time. (I probably haven’t been on the jungle boat fifty times, but you get the idea.) That phrase kept going through my mind when we were down in Southern California Father’s Day weekend. The traffic was horrendous. Saturday afternoon from Highway 101 to California 134 to I-210: mile after mile of 20 mile-per-hour traffic. We couldn’t believe it. Actually we could. Depending on the route we take we experience something like that every trip. I just conveniently forget. Depending on where you are in the Bay Area, traffic can be pretty bad, but to me Southern California traffic is more awful more of the time. I really do love seeing my family, but I’m glad we live in the Bay Area. We were down in Southern California visiting family Father’s Day weekend. We had some down time, so while Terry took a nap I watched the Dodger game on TV. While I admit to being a converted Giants fan, I grew up listening to Dodger baseball on the radio, and am a devoted Vin Scully fan. So it was with pleasure that I sat down and watched several innings of the Dodger-White Sox game. (Say what?! Yes, inter-league play.) And you know what? Vin Scully has lost nothing. He is every bit as sharp as he was when I was six years old and the Dodgers had only recently moved from Brooklyn to Los Angeles. He is truly amazing, and I’m so glad he’s still around to listen to when I have the opportunity. When I was small my parents would talk about having family “back East.” I wasn’t entirely sure where that was, but it turns out to have been Michigan. Not really back East to many people, but certainly to the east of California. I remember asking once whether people “back East” needed refrigerators and whether they couldn’t just put their milk and cheese outside in the snow. While that could conceivably work in the winter in Michigan it certainly wouldn’t be practical in those hot, humid summers. 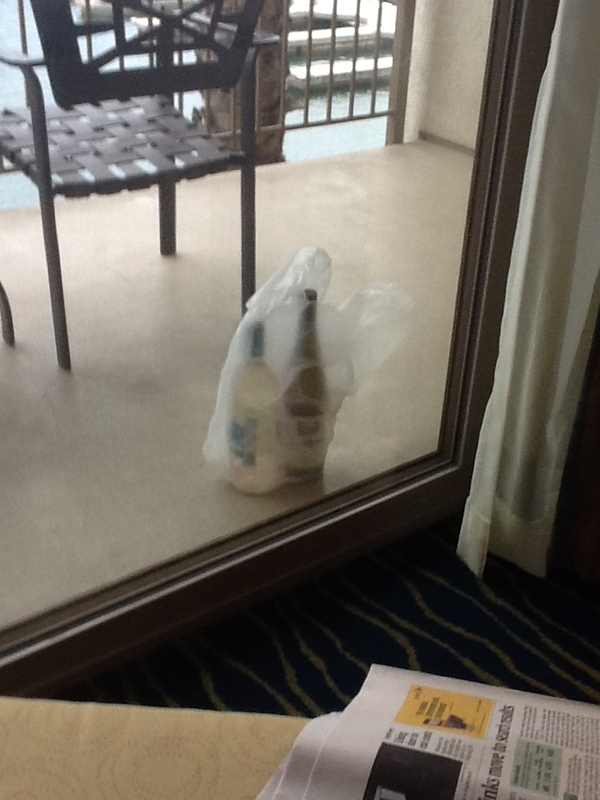 I had to chuckle, then, about how we kept our wine chilled when staying at the Hampton Inn Channel Islands Harbor on our way back from seeing my family Father’s Day weekend. There was no refrigerator in the room and it was downright chilly outside. So for that evening, at least, it worked out just fine. I thought that my blog was overdue for a name change. Csquared thoughts is a little silly, though it does make logical sense. Our Internet domain is csquared.com and both of our car license plates have variations of csquared on them. Terry Cobb. Mike Christie. Csquared. But I’m not sure csquared thoughts means anything. There’s a long-time columnist in the Gilroy Dispatch, Lisa Pampuch, who wrote a column called My Point Exactly. I always liked that title, and used it in a Facebook post I made yesterday. I noticed that Lisa hasn’t had a new column since April, so I thought I would, quite honestly, steal the title for my blog. Problem is that Lisa has a blog right here on WordPress by that very title. Then there’s the book by Ellen DeGeneres called, My Point, and I Do Have One. I love that title and I thought about using it, but the book is still very much in print, and I’m not really up for receiving a cease and desist order from Ellen’s attorneys. Besides, I might want to attend a taping of her show some day. So what’s left? Sometimes I tend to ramble, and I need to bring my commentary to a conclusion by saying, “My point being…” Ah, that works! So welcome to my point being.